BEST Fluffy Pancakes - Kosher In The Kitch! 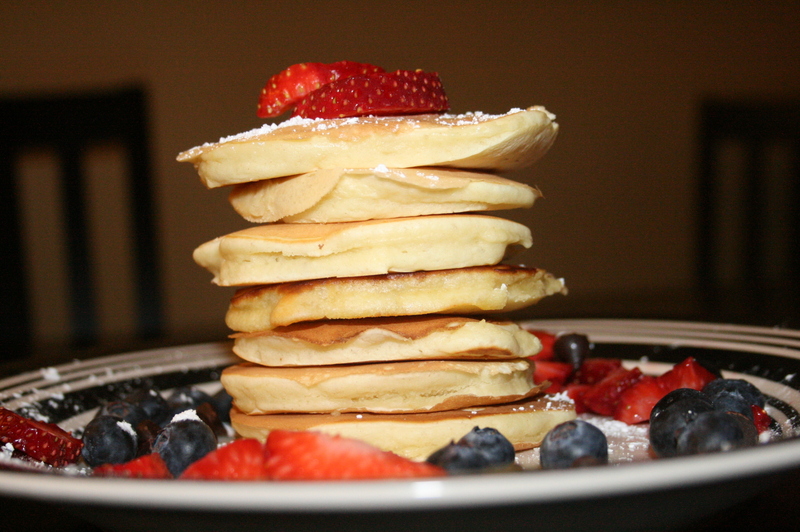 BEST Fluffy Pancakes - Kosher In The Kitch! I’m married with a kid yet most Sunday mornings you will still find me at my moms eating breakfast.I’ll drop everything to run over and have a bite of her light and fluffy pancakes dripping with sweet syrup. Last winter my brother called me to let me know my mom was making her famous pancakes and I ran over. It was during a huge blizzard! I was still in my pjs when I got the call, thinking with the crazy weather I would be home all day. I threw on clothes, slipped into my rain boots and got there 10 minutes after he had called. One bite of those light and fluffy pancakes was worth every minute of walking in the freezing snow! These are so good, I don’t just have them in the A.M., last night I served them for dinner with fruit, chocolate chips and syrup. Breakfast for dinner doesn’t get any better than that! In a large mixing bowl, combine the flour, sugar, baking powder and salt. Mix in the milk, eggs & oil until well combined and smooth. Heat a lightly oiled skillet or frying pan over medium heat. Using a 1/4 cup measuring cup, scoop the pancake batter onto the griddle. When pancake is golden brown, flip to cook other side. Brown both sides and serve hot with syrup, fruit, whipped cream or a light dusting of confectionery sugar. does oil go in the recipe or is it just for the pan? The oil goes in the recipe when mixing in the milk and eggs. These really are delicious. I use this recipe now instead of an old one which I didn’t love. So glad you like them! They are my go to recipe when making pancakes. It’s easy to have fun and mix it up by adding lemon zest, chocolate, berries or even peanut butter to the batter. 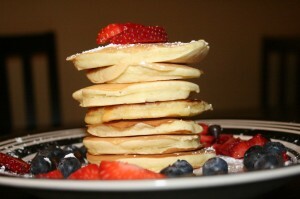 These are simply the best pancakes I have ever had the pleasure to make! And, my whole family loved them! And they were really really easy!! Thank you for sharing. So happy you like them! They are favorite if mine as well. I make them weekly for my son. He loves adding blueberries! is there any baking powder in this recipe? I have never tried it with baking soda. If you do let me know how it comes out!